Republican Donald Trump is seriously ahead of his aggressive rival, Hillary Clinton. At the moment, it is known about 255 of the 270 electoral votes cast for him, while Clinton has a total of 209. 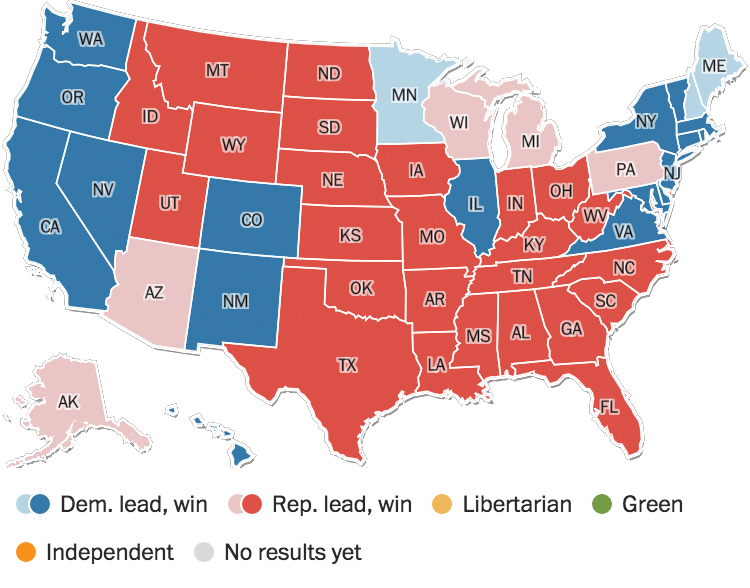 Trump has won a landslide victory in a number of key states. If Alabama, Arkansas, Wyoming, West Virginia, Indiana, Kansas, Kentucky, Louisiana, Mississippi, Missouri, Montana, Nebraska, Oklahoma, North Dakota, North Carolina, Tennessee, Texas, South Dakota, South Carolina, Idaho, Arizona and Utah are traditionally considered as conservatives ones, possibilities for the final victory are going to be in Ohio and Florida. According to surveys, in a number of other contentious states the population supports Trump. So if the official information confirms the survey data, it would be possible to celebrate Hillary for her vision. A few days ago, she still canceled a salute, ordered earlier in honor of her supposedly victory.